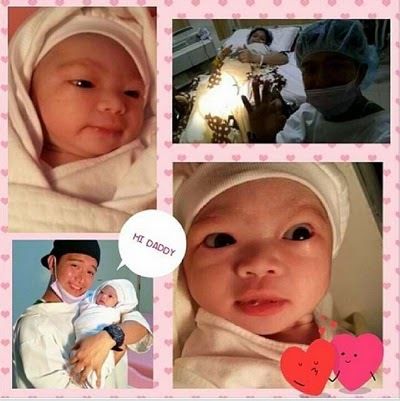 April 4, 2014; Melai Cantiveros gave birth to her cute and healthy baby girl with husband Jason Francisco around 8 PM of April 3, 2014, Thursday, via normal delivery. Jason was so thankful as he posted on his Intagram the news about their first baby. Melai Cantiveros-Francisco real name is "Melisa Bunayog Cantiveros" born on April 6, 1988. She is a Filipina actress, host, comedienne, and fifth female Big Winner of the reality show Pinoy Big Brother, while, Jason Francisco as real name "Jason Veron Marasigan Francisco" was born October 11, 1987, also a Filipino actor and comedian which was the 3rd placer in Pinoy Big Brother: Double Up. Big Brother is a reality game show franchise created by John de Mol. Melai and Jason started their love story on Pinoy Big Brother and the couple revealed September 2013 that Melai Cantiveros was conceiving their baby. Jason and Melai got married last December 2013 while Melai was around five months pregnant. Melai is now currently with her family in General Santos City. In behalf of this Centertechnews blog authors we congratulates the couple Melai and Jason for having their baby.